A very special pack trip and wilderness ride inside the beautiful Tsylos Provincial Park of British Columbia, Canada. The park underlies very strict environmental rules, making it a perfect setting for a wilderness trail-ride and camping trip deep into the refreshing Canadian backcountry away from all civilization. Here we are out with Mother Nature, sleeping in tents or if weather permits, under the open star filled sky. No roads, no phones; just pristine wilderness, clean mountain air, crystal blue water, open meadows, and spectacular views! Start your trip with a breathtaking flight over the Coast Mountains with its glacier topped peaks and reflective mountain lakes and as you are delivered to the "door step" of the lodge at Chilko Lake. You will spend your first afternoon going on a short introductory ride to get to know the horses. Then everyone will get together to go over preparation for the trip and how to pack properly. An excellent dinner & glass of wine is waiting for you at the main lodge to welcome you in style and you will sleep well in your tent that night as you look forward to what the next day brings! Tomorrow we are off and will ride deep into the mountains where there is no road access, so all food and equipment is transported by pack horses. Weather and nature conditions will determine the route we will take, but no matter which way we take you - you will have a wilderness experience of a lifetime in and around the majestic Tsylos Provincial Park, the traditional grounds of the Chilcotin Native tribe who have roamed these mountains for generations. The itinerary can either be "Goat Mountain Range" or "Wild Potato Mountain Range"
If a trip has to be cancelled due to not enough persons or nature, guests will be accommodated at the lodge. Jagged peaks and raw beauty abound, experience horseback riding into the pristine wilderness of Chilko Lake. A 9:30am charter flight takes you from Vancouver across the magnificent glaciers of the coastal mountains to Chilko Lake, where our host will greet you at the private landing strip of the ranch. After lunch and a short introduction you get a chance to test your horse on a 2-hour ride. Upon return some cool drinks on the porch and then a delicious dinner with fine wines await you. Overnight in tents near to the Lodge. In the morning of day two you start your pack trip which will eventually be returning in the afternoon of day seven after spending 6 days in pristine wilderness. The ride goes high up into Goat Country. It is rugged, wild and absolutely beautiful! You ride along Chilko Lake for the day spending the first night at Moose Lagoon. Then you cut up into the Goat Valley where you spend four unforgettable days riding over mountain tops and through breathtaking valleys. Towering 11,000 foot peaks surround the base camp with three large glaciers rising out of the valley floor at the south end. No roads, no phones, the perfect get-away and a chance to get back to the essentials of life. The abundance of alpine flowers throughout the valleys and surrounding mountains is overwhelming. The whistle of the plentiful marmots accompany you on each day to new mountain peaks and wild valleys. Goat Camp is named after the majestic Mountain Goats that call this area home. Often wild deer visit you in camp to nibble on the grain. We use a pioneer tent with cook stove, table and benches for a warm, relaxing evening dinner. We might tell some tales while sitting by a roaring bonfire watching the many stars or the Northern Lights. This trip offers plenty of time to relax, hike, photograph wildflowers or wildlife. If the group so desires, the last day offers an optional fast return ride to the lodge on Saturday. Overnight and farewell dinner at the lodge/ tents outside the lodge depending on availability. Morning flight back to Vancouver - arriving early afternoon. Do not book a flight out before 3:30pm! Ride through high alpine plateaus, hidden valleys, deep mountain passes, and open sandy beaches. Enjoy the splendid views, the immense variety of wildflowers, ancient fossil beds, and the companionship of your fellow riders. A 9:30am charter flight takes you from Vancouver across the magnificent glaciers of the coastal mountains to Chilko Lake, where our host will greet you at the private landing strip of the ranch. After lunch, we will brief on the trip and gear (saddlebags, duffle bags, sleeping mats and tents). Later meet the horses and have a short introductory ride. After dinner time, to repack your duffle bags for the trail ahead. Overnight in tents near to the Lodge. Head out from the ranch, climbing about 4,000 feet to the high alpine, with views of Chilko Lake and the Coast Mountains. Camp is by a small lake hidden in the valley, where you can swim or fish for small trout. From Fish Lake you continue climbing to higher alpine plateaus and cross over to Echo Lake. The camp is situated on the shores of small lake and overlooks the Echo Valley. The lake is cold, but great for swimming. Stay here for two nights. This is a free day and you can choose to spend the day in camp relaxing, hiking, or join the ride and explore the neighboring mountains. Take a nap on the side of an alpine meadow surrounded by majestic mountains and alpine wildflowers. If conditions are good, there may be a small amount of cantering on the ride. 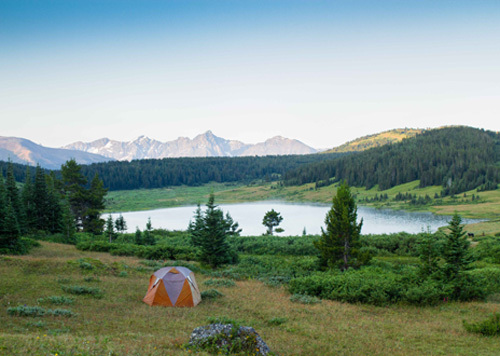 Pack up camp and head north with Stunning views and changing scenery. The countryside changes from mountain valleys to softer slopes, and descends about 4,000 feet into Tatlayoko Valley. At the steepest part of the descent you will be asked to hike down the mountain for about 30 minutes to assist your horse. Camp is located adjacent to Tatlayoko Lake, ideal for swimming. Tatlayoko Lake and valley is a small ranching community. On Thursday the trip meets the truck, and all gear is transported by vehicle from here. This means there may be possibilities for some canters on the last two days. Camp is packed by vehicle and you ride through Lincoln pass to Choelquote Lake. If conditions allow there may be some canters where trail conditions allow. Choelquote Lake is a warmer mountain lake and offers beautiful sunsets and open grasslands along the eastern part of the lake. Camp is packed and taken by vehicle to the lodge whilst you saddle up and ride along Choelquote Lake, crossing the Chilko River by bridge. Travel along the Chilko River which, if conditions allow, offers nice canters throughout the ride. Arrive back at the lodge where camp has been set up for you. Time for a hot shower, soak in the Jacuzzi and a cold beer or drink on the decks prior to the barbecue. After an early morning breakfast you will be transferred to the airport for your flight back to Vancouver, or join us at the lodge for another week of a seven night lodge riding vacation, or fly fishing trip. Do not book a flight out before 3:30pm! Pace: Slow with steep slopes. All riders must be physically fit, able to mount and dismount both sides of a horse, walk, trot, canter, and saddle up. All riders must be physically fit, able to mount and dismount both sides of a horse, walk, trot, canter, and saddle up. This trip requires intermediate to advanced riding skills. The riding is primarily walking due to the terrain, but for the last two days the camp is transported by vehicle which offers the riders some opportunities to trot and canter depending on the group. On one day during the trip, you will hike down a steep mountain leading your horse for about 45 minutes. Rides each day are from 4.5- 6.5 hours per day. This trip requires low intermediate to advanced riding skills. The majority of the trip is spent walking your horse, due to the rough terrain, except the last day back to the Lodge where there is some trotting and cantering. Rides range from 9-10 hours the first day and 4-6 hours daily the rest of the trip. Our horses are well trained and excellent traveling companions in the mountains. Born and raised in the Chilcotin, they are connected with the terrain and are confident, sure footed and dependable. We are proud of our horses and can easily say that they are some of the most accomplished mountain horses anywhere. You will love them. They are personable, trustworthy, and know how to do their job. The horses are a mixture of many different breeds (Quarter, Arab, Draft, Appaloosa, Paints, Morgan) and they have been chosen for their disposition, willingness and agreeable personalities. We match you up with a horse that suits your personality and riding ability. Each horse comes with two saddle blankets, Western saddle, bridle, halter, lead rope and a set of saddle bags for you to carry light-weight items needed during the day. Your horse will take good care of you on your journey and, in turn, you will help take of your horse. Your horse will appreciate a good brushing in the morning and at the end of the day when you pull off your saddle. You are going to find that you will quickly bond with your horse. We all work together to ensure that the horses have plenty of sweet mountain grasses to eat and cold spring water to drink. Your horse trail guide will stake, hobble or free range the horses in the evening on meadows of excellent alpine grasses. We use pack horses to carry our food and supplies into the mountains. Each pack horse has a special pack saddle and we use the traditional “sawbuck pack saddle”. Each horse carries a set of pack boxes which hold the food and cooking gear, plus two tents and three duffel bags. To secure the load and keep the packs dry, we cover the load with a tarp and secure it using the “Michigan Hitch”, a tried and true method of keeping the pack nice and tight. Usually three to five pack horses accompany us on a trip. Of course, this depends on the size of the group. Two trail guides will be accompanying you on your horse journey through the mountains. Both guides are skilled horsemen, as well as experienced in horse riding in the mountains and wilderness. They love the outdoors and have absolute commitment to safety and attention to detail to give you peace of mind and a rewarding adventure. Each guide brings different skills and talents to the trip. One guide is in charge of the group, horses, horse packing, wood, water, fire, and grass, while the other guide is in charge of the camp, food preparation, packing of the cook boxes, and the care, organization, and cleanliness of the camp. Each horse trail guide can step into the others position and help you or each other during the trip. This is a pack trip with very limited or no vehicle support. All equipment and food will be transported by pack horses, so pack light! Weight restriction for your luggage is 35lbs. Please pack in soft-sided luggage. Tents, sleep pads, duffel bags, and saddle bags are provided. Extra items can be left at the lodge during your ride. Our weather can be hot, cold, or wet, appropriate attire for the great outdoors and changing weather conditions is a must. Dressing in layers that you can add on or take off is best. All riders are part of a team and need to be able to depend on each other. Everybody helps out and is in charge of his/her own horse and gear. This is a pack trip, so nights will be spent camping in tents. The first and last night of the trip, you are accommodated in our very comfortable tent camp near the lodge, or if available, we will give you one of the lodge cabins. The remaining 5 nights are spent camping in the wilderness. You will be sleeping in 2-person dome tents on a comfortable sleeping mat, which will be provided for you. You can also choose to lie beside the fire and watch the stars. Please remember to bring your own sleeping bag! You will experience authentic camping, meaning lakes and creeks for showering and shovels to dig a hole for washrooms. Camp chores, such as fire building, chopping wood, getting water, staking out horses, making lunches and salads, washing dishes, and setting up and breaking down camp are a group effort; we encourage everyone to lend a helping hand when needed. No single supplement based on sharing a tent. Single tents can be requested, but we are limited to 2, so please let us know in advance. All meals are included from lunch on Day 1 to breakfast on your last day. Our campfire gourmet meals are prepared over an open fire and are delicious and plentiful. The morning’s meal is a hearty Canadian breakfast of bacon, sausage, eggs, pancakes, eggs benedict, or our famous Chilko scramble, all cooked over a camp fire. Lunch is packed in your saddle bags and is made up of sandwiches along with an apple or orange and a candy bar. Dinner is a fresh salad, vegetable, meat, pasta, rice or potato. Everything is packed with us on our steady pack horses. We also take a mini bar which is chosen prior to leaving the lodge. It is beautiful to get to camp after a gorgeous ride for the day, get your home away from home set up, the horses staked out, and enjoy a glass of wine while dinner sizzles over the campfire.